If you’re like me, you’ve baked a gooey pie or cheesy pizza and ended up with goop all over the bottom of your oven. And if you haven’t, you’re incredibly lucky because cleaning that mess up is never an easy task. So when the folks at Chef’s Planet asked if I wanted to try out their nonstick ovenliner, I jumped at the chance. The ovenliner fits all size ovens–if you have a convection oven with a fan in the back, no worries, just cut the liner so it fits. 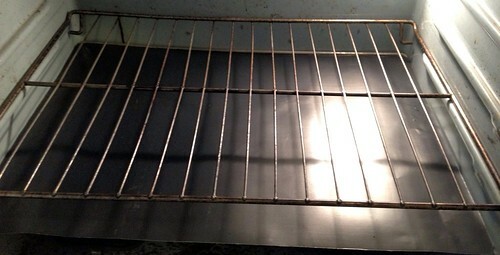 I have an old school electric oven from the 70s and it fit perfectly without needing a trim. I put the ovenliner to the test when I made a salted caramel apple tart (recipe coming soon) and a pizza, and cleanup was super easy–just remove the ovenliner from the oven and wipe it down. No more burned stuff on the bottom of my oven (which may or may not have sometimes resulted in, you know, smoke). I’m a happy camper! And speaking of gooey caramel, Chef’s Planet is having a Messy Recipe Contest over on Facebook where they are giving away baking baskets full of cool baking stuff. You can enter until December 31, so check it out! Disclosure: I received an ovenliner in exchange for this review.